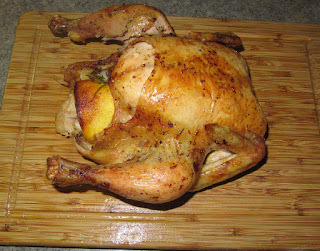 Nothing beats a good roasted chicken, it is one of my favorite things to make and to enjoy. The great thing is that it is really very simple to make and will always taste delicious. 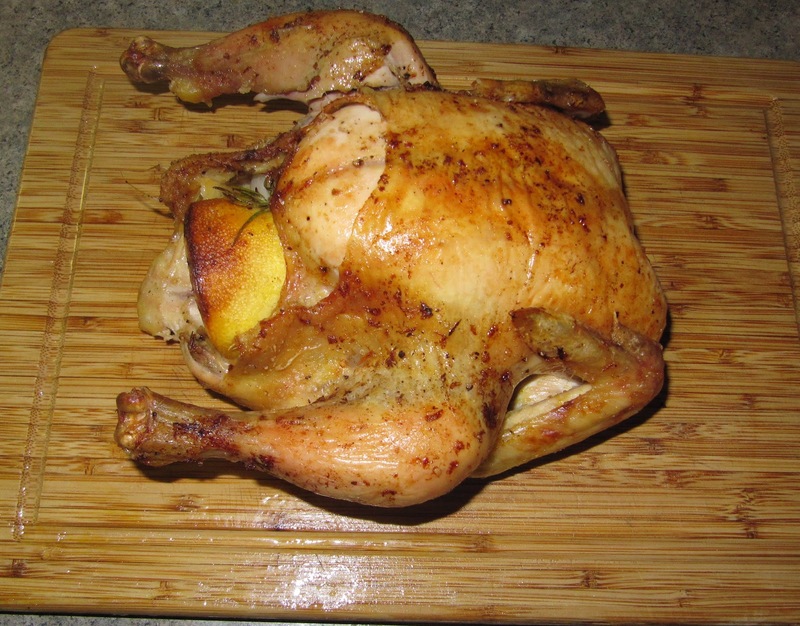 I can't have roasted chicken without lemon, it is my favorite flavor to go with the meat so I made sure to incorpate as much of that flavor as possible. To go with the chicken I roasted some broccolini and placed on a bed of linguine that is finished with some bacon and asiago cheese. I made a simple salad with a lemon vinaigrette to finish off dinner. To prepare the chicken I first made sure it was completely dry. This is to make sure that there is no moisture left on the skin so the skin can crisp up properly. I stood the chicken up with the cavity facing up and seasoned the inside of the bird with a few pinches of salt and pepper. I stuffed the inside of the chicken with a lemon sliced in half, 2 quarters of a small onion, 2 sprigs of rosemary and 3 cloves of garlic. To prepare the outside of the chicken I combined the zest of one lemon with 2 tablespoons of olive oil. I spread the lemon olive oil mixutre all over the the outside of the chicken and sprinkled a few pinches of salt and pepper on the skin. 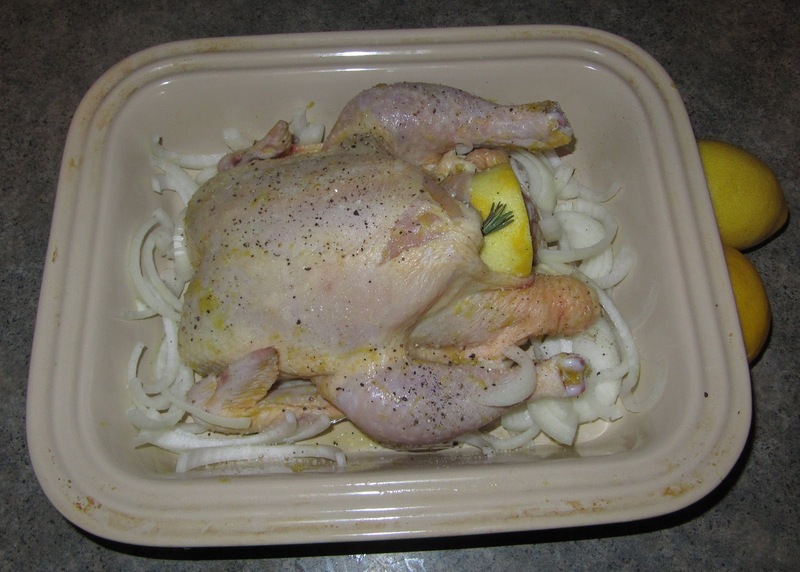 I placed the chicken in a baking dish over a bed of sliced onions. I started the oven at 425 degrees, then proceeded to lower the temperature to 375 once the chicken was in. The chicken roasted for about an hour or until the leg easily pulls away from the thigh and the juices run clear. I took the chicken and placed it on a dish to rest. I placed the pan juices along with the juice of one lemon in a saucepan and simmered for about 15 minutes to make a quick pan sauce. I have to admit I had no idea what broccolini was when I saw it at the store other than it seems like more tender broccoli. I found that this vegetable is basically a mix between broccoli and gai lan or Chinese broccoli. 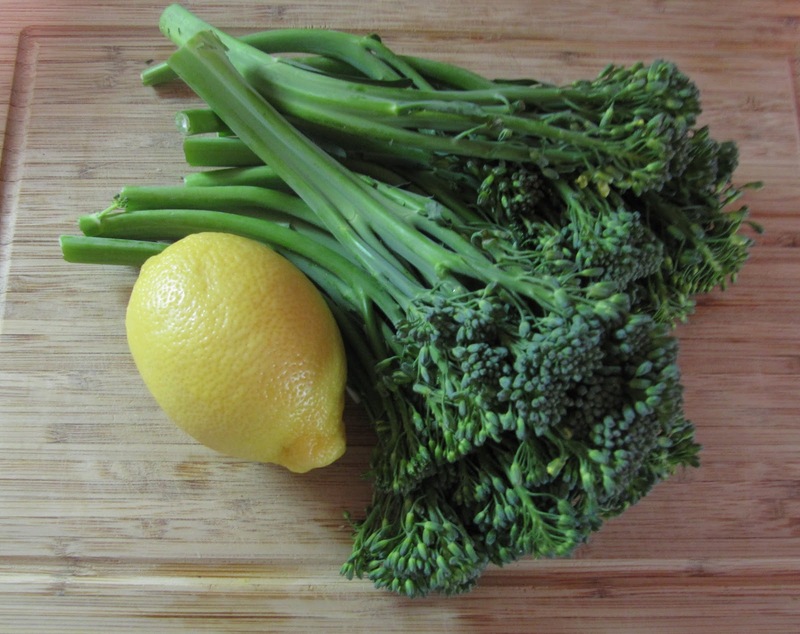 The taste is somewhat similar to regular broccoli except the stems are more delicate and the tops a bit crunchier. I placed the broccolini in a baking dish with thinly sliced garlic. I drizzed with olive oil and sprinkled with salt and pepper before placing in the same 375 degree oven for about 15 minutes or until the stems were al dente. To prepare the pasta I boiled a couple of handfuls of dry linguine in a pot of boiling water. In the meantime I sauteed some bacon bits I fried up earlier with diced onion in a large pan. I stopped boiling the pasta a couple of minutes early because I wanted to finish cooking in the pan with the bacon. I added the pasta to the pan along with a couple of ladles of pasta water. While heating the pasta on medium I added about a handful of shredded asiago cheese and a couple of teaspoons of ground nutmeg. I tossed the pasta with the roasted broccolini and I continued to cook through until the pasta was al dente. 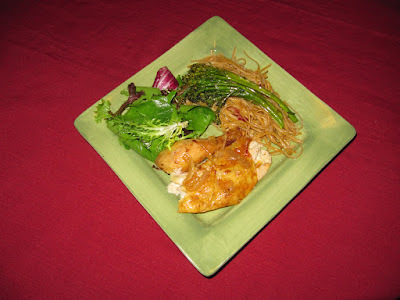 I served the chicken alonside the linguine with the broccolini sitting on top. Alongside I added a simple salad with lemon juice seasoned with salt and pepper. The chicken was roasted perfectly. The skin was crispy and the breast was moist and tender. I spooned a bit of the pan sauce over the chicken to add additional lemon flavor at the end. The broccolini went well with the bacon and nutmeg in the pasta as well as the lemony chicken. For me nothing quite compares to a roasted chicken, it is a fail proof dinner that you can simply pair with a salad or with any other side for a simple and satisfying meal. As an added bonus once cleaned of all the meat, the chicken carcass can be boiled with carrots, onion and celery to make a tasty chicken broth. 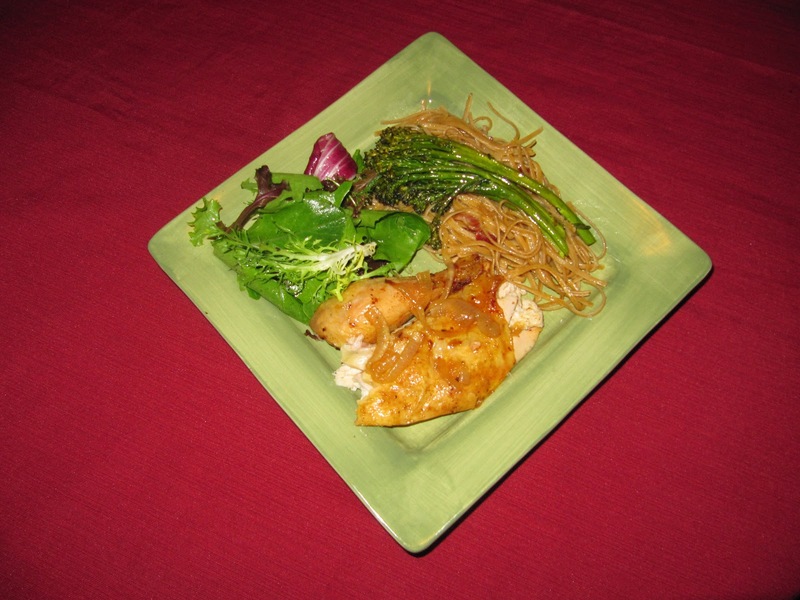 This is the first dish on my blog for which I have written a full recipe. Please try these dishes and let me know how it goes! Make sure to remove the giblets from the cavity and rinse out the inside and outside of the bird. Pat dry with kitchen towels to assure that the chicken is completely dry inside and out. While holding the chicken with the cavity facing up, sprinkle a few pinches of sea salt and black pepper inside of the bird. Proceed to stuff the cavity with the lemon, onion rosemary. In a small bowl combine lemon zest a couple of tablespoons of olive oil. Rub the olive oil mixture over the skin of the chicken. Sprinkle the chicken with salt and pepper, rubbing it in slightly to make sure it is properly coated. 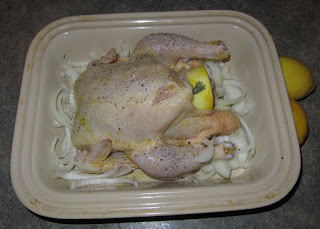 Place the chicken in a roasting pan or a deep baking dish and place in the oven. Lower the oven to 375° and cook for about an hour or until the leg cuts away easily from the thigh and the juices run clear. Allow the chicken to rest for about 15 minutes before carving to allow the juices to redistribute. 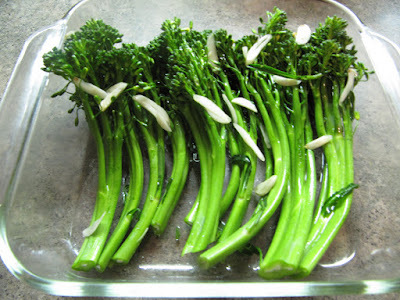 Place the broccolini in a baking dish with sliced garlic, drizzle with olive oil and sprinkle with salt and pepper. Place in the oven for about 15 minutes or until the stems are al dente. Set aside. Place linguine in a large pot of boiling salted water and cook until just under al dente. While the pasta cooks, sautee the bacon on high in a large pan until crispy. Remove the bacon from the pan, drain all the fat and return the bacon to the pan along with the diced onion. Remove the linguini from the pot of water a couple of minutes early and add directly to the bacon and onion, adding a few tablespoons of the pasta water as well. Toss in the roasted broccolini and continue to cook through until the pasta is al dente. Serve the pasta on a plate, then lay the roasted broccolini across the top. 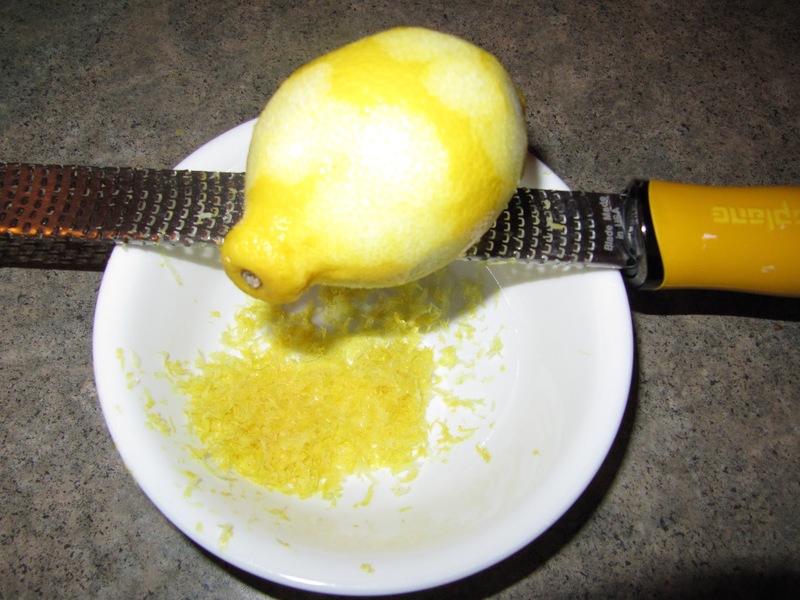 While using a whisk slowly pour the olive oil into the lemon juice until fully incorporated. Pour vinaigrette over the salad greens and toss. Season salad with salt and pepper to taste.